With dorm beds, budget private rooms with shared bathrooms and deluxe private rooms with private bathroom. Some rooms with self-catering kitchen facilities available. Welcome to The Beehive Hotel - a stylish, budget, eco-conscious hotel/hostel owned by an American couple, Linda & Steve, who came to Rome to follow a dream. We have dorm beds, private room both with and without private bathrooms. Some rooms with self-catering kitchens and an on-site, organic cafe that specializes in Vegan and Vegetarian food. 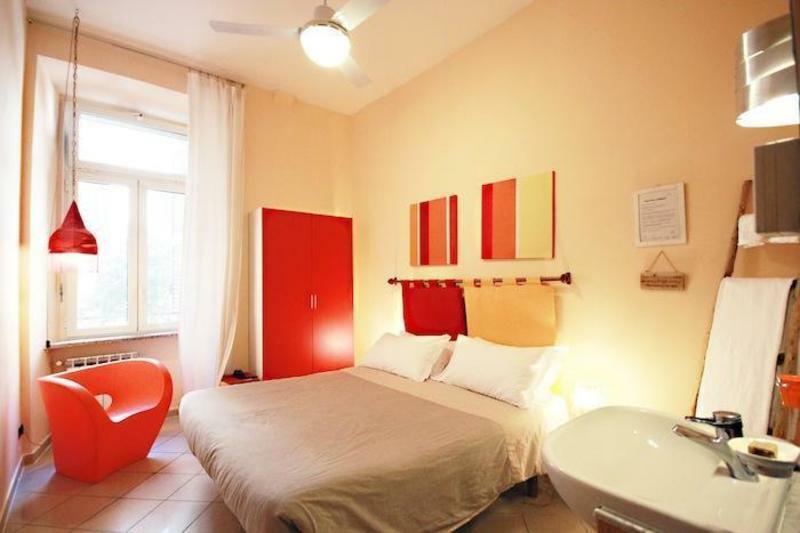 In 1999 we packed up our apartment in Los Angeles and, along with our 2 cats moved to Rome and opened The Beehive, a unique cross between a budget hotel and an upscale hostel - a place where you can feel at home. Everything about The Beehive Hotel & Hostel reflects our own personal values - we're conscious about the environment, passionate about social issues, and genuinely want to be helpful and hospitable. We love to share the kind of information that helps you get the most out of your travels. Check in from 07:00 to 23:00 - Rooms are ready by 3 pm at the very latest but guests are welcome to come and check in and leave bags. In some rooms (the Sweets) we have AC for an additional 10 euro per day. Follow signs to trains. Buy a ticket at the platform, the easiest way is by using the self-service machines which accept credit cards as well as cash, in euro. These machines are multi-lingual. Tickets cost 14. Be sure to validate your tickets at the machines located at the beginning of the platform or you risk being given a fine - not the best way to start your Roman holiday. The airport train (Leonardo Express) departs every :08 and :38 minutes past the hour. Board the Leonardo Express heading toward Termini station (Stazione Termini) and get off at final stop (Termini). It is about a 30 minute ride form the airport to Termini and there are no other stops. The train arrives at Track 24. Upon exiting the train, walk down the platform towards the main gallery (where retails shops, newstands, etc are located) - do not take any other exits or steps or escalators. It will be a few minutes walk from Track 24 to the main exit you need. With the train tracks behind you, take the main exit to your right and once you reach there, cross the street. With Termini behind you, that street is via Marghera - our street. We are located a straight shot from that exit, just 2 blocks away on the corner of via dei Mille and via Marghera at via Marghera, 8 on the left side of the street. Please note that the numbers on our side of the street do not correspond with the numbers on the other side of the street. On the corner of via dei Mille and via Marghera, there is a yellow wall and a silver door on the via Marghera side of the wall. You must ring at the buzzer on the right hand side of the door to be let in. Our reception hours are 7am to 11pm/23:00. We must be notified in advance for arrivals outside those hours. Please note that The Beehive's sign is not very big and sits flush against the wall so does not stick out on the side - the sign is about 20 x 30cm (8 x 12in). It has a white background with dark blue and yellow lettering. It is located underneath the #8. There is a light that shines on it at night. For detailed information including photographs on how to reach us from Termini train station, please take a look at this post from our blog here. Outside the airport is a shuttle run by Terravision. Tickets cost approx. ï¿½4 each way. The last stop on the shuttle bus is on the Via Marsala side of Termini train station. Please follow directions starting at #4 above. As of 1 October 2006, taxi service from Fiumicino and Ciampino airports to Rome's center is now set at a flat rate of ï¿½40 from Fiumicino and ï¿½30 from Ciampino. If you would like private airport pick-up, we do work with a car service and price depends on number of people and time of arrival. For more information, please send us an e-mail. If you would like a car or shuttle to the airport for your departure, we can arrange it at our reception. We do not have parking facilities. For information on nearby parking garages, please contact us by e-mail.